Winter is right around the corner and, for a lot of us, that means BBQs are reserved for only the odd weekend when the weather warms up enough. Rather than get one of those schlocky extendable awnings they sell on late-night TV, shelter your guests in a stylish sphere. What's a G-Pod? This is a G-Pod. Sure it looks like something 007 escaped from Dr No in, but it's really a prefabricated sphere constructed of laminated pine and curved, UV-tinted polycarbonate. Built by Farmers Cottage Lamps of Birmingham, England, it's available in four sizes starting between $US14,000 and $US30,000. For $US14,000, you'll get a 2.3m diameter model (seats six) with a rotation base that allows the entrance to turn away from the wind or sun and fold-flat furniture that converts into a bed. $US30,000 will net you a 3m diameter model that's more of an in-law unit than an entertainment space. 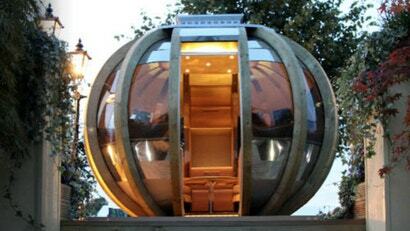 It can be wired into the home's electrical and host up to 14 people.